MSNBC TV translator Jacob Keryakes, who said that a copy of the message was later posted on a secular Web site, noted that the claim of responsibility contained an error in one of the Quranic verses it cited. That suggests that the claim may be phony, he said. "This is not something al-Qaida would do," he said. July 11, 2005 1400 PST (FTW): Without more information about this potentially critical transcription "error" by the message's author, we can only establish that the quoted verse containing the error does indeed mean essentially the same thing as the correct verse. Sure enough, recourse to a posted translation of the message alongside a web-based searchable Koran translation shows that the error, if it exists, does not materially impair the meaning. It must be a mistake in spelling or orthography, or the use of a synonym. The apparent source of the "error" claim, MSNBC Cable TV translator Jacob Keryakes, turns out to be a signatory to an October 2004 endorsement of the Bush-Cheney ticket by "THE MIDDLE EASTERN AMERICAN NATIONAL CONFERENCE. "1 That organization includes notable non-Muslim and / or non-Arabic Americans from the Middle East; Mr. Keryakes is a Coptic Christian from Egypt. Keryakes is also the key person used to translate video releases allegedly from Osama bin Laden,2 and read those translations into the broadcast news. Muhammad [47.7] O you who believe! if you help (the cause of) Allah, He will help you and make firm your feet. God, may He be exalted, said, "If you aid God, God will aid you, and will plant your feet firmly." Immediately after the posting of the claim of responsibility by "The Secret Organization of al-Qaida in Europe," readers of the posting whom Mr. Keryakes described as "Islamic radicals" posted their own responses to it (on the same Arabic-only site) alleging an error in its quotation of the Koran, and that therefore the claim was bogus. Those "Islamic radicals," who ought to know better, were mistaken: there is no such error. There are, however, errors in the grammar of the Modern Arabic in the body of the message. Other journalists, too, propagated as fact the report of an error in the Koran quotation, casting doubt on the message's authenticity. Although it is now well known inside the media that there is no error in the message's Koranic portion, as of 12:10 pm July 8, 2005 no news agency has issued a retraction of the report or clarified its origin. I'm not exactly sure which U.S. counterterrorism official said this is potentially credible but it's not at all. In fact this message was even dismissed by supporters of al-Qaida immediately deleted off of the Web forum that it was posted on yesterday morning. Only within minutes really of it having been posted originally. Why was it taken offline? Because the Jihad sympathizers that run that message board determined that it was a hoax, it was illegitimate. Many such messages like that get posted on a regular basis especially since last summer when we saw a flurry of such threats potentially targeting Denmark, Britain and Italy. The same three countries that were targeted in this communiqué. None of these communiqués were legitimate. All of them were hoaxes. The same languages were used in the communiqué. The same targets. It seems this is a hoax as well. It's impossible to be certain but this did not come from a legitimate source of information about terrorist groups like saying the videos and communiqués we see from Abu Musab al-Zarqawi. This, too, comes from the Microsoft Network, and yet there is no mention of any quotation from the Koran nor any mention of the "grammatical errors" of which Mr. Keryakes told me on the phone. CAIRO, Egypt - A group calling itself "The Secret Organization of al-Qaida in Europe" posted a claim of responsibility for Thursday's blasts in London, saying they were in retaliation for Britain's involvement in Iraq and Afghanistan. The statement, which also threatened attacks in Italy and Denmark, was published on a Web site popular with Islamic militants, according to Elaph, a secular Arabic-language news Web site, and Der Spiegel magazine in Berlin, which published the text on their Web sites. "Rejoice, Islamic nation. Rejoice, Arab world. The time has come for vengeance against the Zionist crusader government of Britain in response to the massacres Britain committed in Iraq and Afghanistan," said the statement, translated by The Associated Press in Cairo. The AP was unable to access the Web site where it was posted, which was closed quickly after the reports. But MSNBC TV translator Jacob Keryakes, who said that a copy of the message was later posted on a secular Web site, noted that the claim of responsibility contained an error in one of the Quranic verses it cited. That suggests that the claim may be phony, he said. The group al-Qaida in Europe claimed responsibility for the last major terror attack in Europe: a string of bombs that hit commuter trains in Madrid, Spain in March 2004, killing 191 people. Two days after that attack, a video was found in a trash can outside a Madrid mosque with a statement purported to be from the group's spokesman, called by the nickname "Abu Dujan al Afghani." In the new statement, the group said "the heroic mujahedeen carried out a blessed attack in London, and now Britain is burning with fear and terror, from north to south, east to west." "We warned the British government and the British people repeatedly. We have carried out our promise and carried out a military attack in Britain after great efforts by the heroic mujahedeen over a long period to ensure its success." "We continue to warn the governments of Denmark and Italy and all crusader governments that they will receive the same punishment if they do not withdraw their troops from Iraq and Afghanistan," the statement went on. It was signed "The Secret Organization of al-Qaida in Europe." 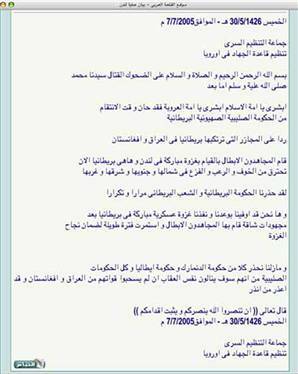 2 "Arab TV airs alleged bin Laden tape." September 10, 2003 - MSNBC's Jacob Keryakes translates a portion of the Al-Jazeera tape purportedly from Osama bin Laden.